We are now only one week away from Thanksgiving here in Canada. My American friends like their version of it about six weeks later than us. I think that means that they just want their Canadian neighbours to have first "crack" (pun fully intended) at all the turkeys and they'll settle for all the leftovers. Just kidding. It probably doesn't mean that at all. Taking time out for counting your blessings and being thankful is what matters, regardless when you choose to celebrate. So when I saw this cartoon out there in cyberspace, you had to know that I would be sharing it. Strangely, it reminded me of that old movie, Planet of the Apes. Remember that classic from the late 1960's? Planet of the Apes is a sci-fi flick that tells the story of a group of astronauts who crash land on a planet and discover that it is inhabited by apes that have advanced much higher up the evolutionary scale than their cousins back on Earth. The apes are clearly the dominant species with advanced speech and intellect. The human-to-ape relationship on Earth is very much reversed on the Planet of the Apes. So back to our cartoon. All I could think about was that perhaps this cartoon depicts what a Planet of the Turkeys might look like. If there was such a place, could this be what their Thanksgiving preparations might look like? If so, perhaps the Planet of the Turkeys would probably not be a wise vacation destination, especially during the holidays. 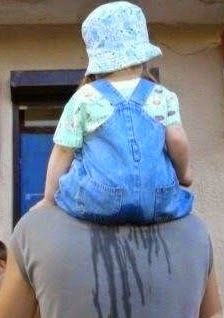 Postscript: If there was ever any question as to my twisted sense of humour, I'm sure this will remove all doubt. A caveat: No turkeys were harmed in the production of this post. Peace. 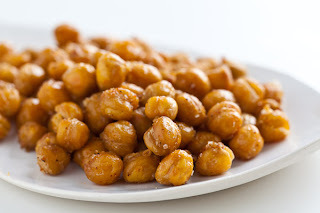 Garbanzo Beans As A Snack? I've been trying to eat a little healthier lately. Talk about tough! In many ways, for me this seems to have become like the proverbial "old dogs and new tricks." One of the killers to that plan has always been snack foods, and as I've discovered lately, especially wheat based snacks. To be honest, I've never thought of wheat as a problem before, but a borrowed book called "Wheat Belly" seems to suggest that it is. For me, even though this book was written by a medical doctor, the jury is still out on that premise. I just cannot imagine myself going completely gluten free. At any rate, it probably would do me the world of good to at least cut back a little on the wheat products that I consume. But what's this got to do with garbanzo beans (also known as chickpeas)? Well as a part of trying to eat healthier, I bought a package of dried garbanzo beans. I'm not too familiar with them, and since I don't recall ever cooking them, I searched online for some recipe ideas. I found a few interesting ones, and one that I thought was perfect as a snack food. At the very least, I reasoned, they're high in protein, and so they must be good for you. I didn't follow the recipe perfectly; I rarely do. The original recipe called for canned garbanzo beans and I had the dried bag variety. I learned that to use dried beans it's always best to soak them for up to 24 hours first, which is something that I did. By the time I was ready to use them, they had almost doubled in size. After rinsing and patting dry the beans, I placed them on a cookie sheet and coated them in olive oil before putting them into a 400F oven for about 30 minutes. I watched that they didn't burn, and at the 30 minute mark, some of the beans started to pop, so I removed them from the oven. I seasoned them with salt and with Zatarain's Creole Seasoning that some friends brought back for me from Texas (I cannot seem to buy it locally here), but I'm sure that any favourite seasoning that you have on hand would work just as well. And now, let me give credit where credit is due. I found the original recipe here. If you decide to try them, drop me a note and let me know what you think. Photo Credit: Steamy Kitchen, Inc.
Post Script: For those interested, I just found this summary of the book Wheat Belly. Someone shared with me again recently how they lost a bunch of weight. While I felt happy for them, all I could think of saying was, "I found it. Do you want it back?" Apparently they did not. Bummer. I guess that means I have to lose my extra weight all on my own. I've never been one for dieting. Granted, some people have had great success with various diets. But for me, well, there's just something about the word "diet" that is a big turn-off. I suspect that is probably true for many people. Maybe it's just semantics, but as I learned recently, perhaps a better way to look at this is not to call it a "diet" but rather a "lifestyle change." There's nothing profound in all this really; it all comes down to a change in attitude and habit. Thomas a' Kempis is quoted to have said, "Habit overcomes habit." That's what I need; I need a new and healthier habit to overcome some of the old and less healthier habits that I seem to have developed over the years. I tried the gym thing, but it really wasn't for me. It's hard to get motivated to go, and I really don't enjoy the crowds or the loud music often associated with it. 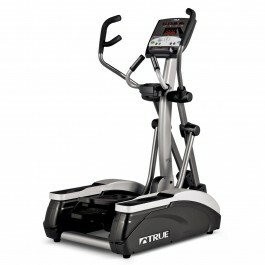 Instead, we went and bought this really awesome elliptical machine by True Fitness. We love it! Though I had someone say to me that they are only "really expensive clothes hangers," that has not been my experience thus far (and hopefully it never will). I'm on it four to five mornings per week before work, and I've never felt better. Another part of the lifestyle change is rethinking what we eat, how much we eat, and when we eat it. Late night munchies are particularly deadly, so I am trying to avoid that practice. Keeping alcohol consumption to a minimum also helps, but as I am a winemaker, I confess that is a bit of a challenge. The good news is, that cursed number on the scale is starting to drop. For that, I am grateful. Oh, and by the way, if you happen to find my lost pounds, I don't want them back either.